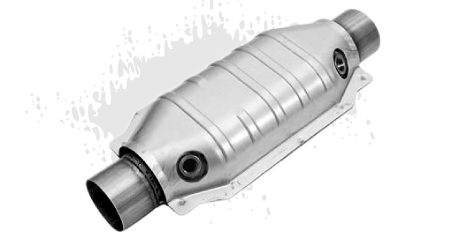 Catalytic converters help to reduce the level of toxins in the exhaust byproducts that result from the combustion process of engines. However, they also help with the efficiency and performance of your vehicle. Essentially, catalytic converters help us to be a little greener, while saving extra green in our wallets. Since exhaust systems have many sensors, most issues with catalytic converters will trigger your check engine light to come on. Your vehicle may appear to be performing normally, but it is still essential to have your vehicle checked right away. Problems caused by your catalytic converter may be hard to observe in an instant, but overtime, you'll be paying a lot of excess fuel costs to compensate for power loss and inefficiency. Catalytic converters use a catalyst to initiate a chemical reaction that turn these harmful chemicals into harmless ones. The catalyst is a ceramic structure that is coated with platinum, rhodium, or palladium. As the exhaust gases flow into this structure, the metal reacts with the chemicals, creating the less toxic wastes of carbon dioxide, water, and nitrogen, which are expelled out of the car.